Ok so first off I cheated last night because Reagan and I had a bunch of errands to run and we got home later than I anticipated. This is such an easy dish to make and even though Reagan doesn’t like to eat much of the bell pepper she inhales the meat! My cheat was I didn’t have ground beef or turkey in the house so I hit up our local Raley’s meat counter and purchased their pre-made meatloaf. I am not a big fan of rice in my meatloaf so this recipe does not include rice. 1/2 cup shredded cheese ~ choose your flavor! In a large bowl mix together your chopped onion, chopped bell pepper from the cut up tops, garlic, pepper, seasoning salt and worcestershire sauce. If you prefer you can brown the onions ahead of time to soften them up. Add in the ground beef and mix together thoroughly. Take the completed mixture and divide into your bell peppers. Put your completed bells into the oven and bake for about 45-55 minutes or until the internal temperature is at least 160 degrees. Top with your choice of cheese and serve. Keep in mind that the juices from the meat will have settled into the bottom of the bell pepper so be careful when you place them on your plate or cut into them as you will have a lot of draining. To prevent, pour out the juice before you place on your dinner plate. Again, if you want to be lazy like me … and no judgements here because at times we all need a little help, check your local meat counter to see if they carry the pre-made meatloaf. Raley’s, Bel Air and Knobb Hill typically always carry it. Safeway or Genuardi’s are seasonal and only carry it during the fall/winter months. As always you can add more vegetables and rice to your mixture if you prefer. If you do add rice (you’ll need about 1/2 cup uncooked white or brown rice) I would suggest cooking it ahead of time so that it’s already precooked before it hits the oven inside your bells. This will ensure no hard rice when you go to eat it! 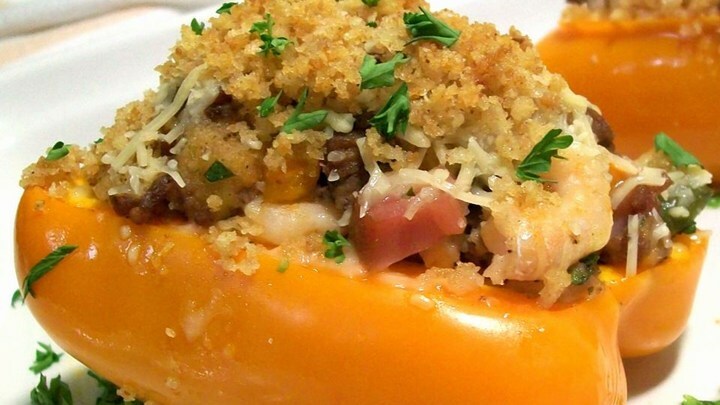 Cooked Bell Peppers topped with Cheese.